Airbus Helicopters recently celebrated the official hand-over of the H145 to DRF Luftrettung. 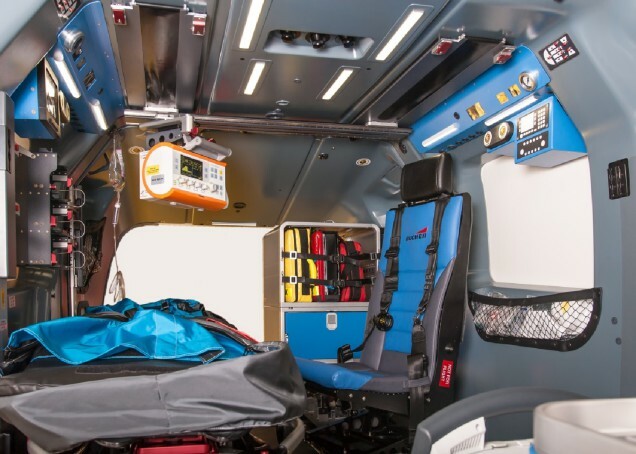 This was the green light for Bucher Leichtbau to begin the first installation in an H145 of their totally redesigned and developed helicopter emergency medical system (AC70). It is the culmination of two years of intensive collaboration with our customers and partners, the air rescue organizations ADAC Luftrettung and DRF Luftrettung, who both have more than 40 years of experience. Thanks to the consistent involvement of different specialists, the user expertise was directly incorporated into the development of the equipment. This has led to new standards of ergonomics, operability and usability. If you would like to learn more about this modern and unique HEMS equipment, then visit us in Amsterdam at the Helitech International on October 14-16th, 2014 where we will be presenting a full scale mockup.